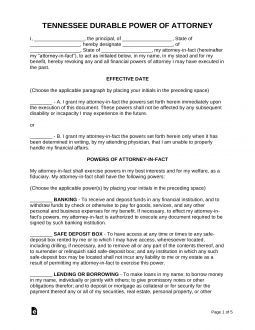 Tennessee Power of Attorney Forms can be employed by an individual (the principal) to appoint a person he or she trusts (the agent or attorney-in-fact) to act as a representative in a variety of matters. Some power of attorney documents allow for the appointment of the named attorney-in-fact to handle a broad range of powers, while others allow the principal to narrow the scope of the granted powers to the agent. In any case, some careful thought as to who should be chosen as the attorney-in-fact should be given because such an agent will be acting in whatever capacity the principal has decided upon. While this is cut and dry in most cases, an agent’s ability to act on behalf of the principal to the principal’s satisfaction will depend mainly on the reliability of that agent and the principal’s ability to determine and report his or her directives. Durable (Financial) Power of Attorney – This type allows the principal to appoint an agent to possess a broad range of financial power over the principal’s assets and property. In addition, this type remains in effect even if the principal becomes incapacitated. Signing Requirements: No statutory definition; however, it is suggested that the document be signed in the presence of two (2) witnesses and notarized. General (Financial) Power of Attorney – This form also allows for the appointment of another to manage the finances of the principal, but it differs from the durable form in that it automatically terminates if the principal is deemed incapacitated. Limited (Springing) Power of Attorney – This form is for a principal to appoint an agent form a limited transaction or a discrete time period. Minor Child Power of Attorney – Allows the parent of a minor to handle their care, educational, and health care needs for a period of time (not specified by the State). Medical (Health Care) Power of Attorney – Lets a person seek someone else to be their surrogate in the chance a medical condition does not allow them to make health-related decisions for themselves. Motor Vehicle Power of Attorney (Form RV-F1311401) – This is for use when you seek to have a representative represent your interests relating to your motor vehicle in front of the Tennessee Department of Revenue. Real Estate Power of Attorney – Appoint an agent with a fiduciary duty to represent your best interests in regards to real property transactions and/or management. Revocation of Power of Attorney – This form is for use when a person who has previously conveyed powers power of under canceled. Tax Power of Attorney (Form RV-F0103801) – A principal can appoint another to represent them in front of the tax authority using this form.